.......Stay amidst unspoiled natural beauty of Himalayas. Lapped Mountains & the river Beas. Hotel Beas View, is a drive in hotel, surrounded by apple orchards offer an ideal retreat for holiday of a lifetime with the comfort and luxury. 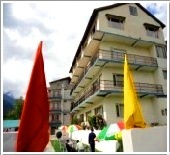 Hotel is situated on the corner of river Beas and half km from bus stand and away from hustle and bustle of Manali town. Hotel has got 3 star deluxe facilities. Elegant furnishing, quality service, hygienic condition and delicious food served by its multicuisine restaurant makes this Hotel on of the most popular and easily accessible hotel. The Hotel is well managed and assures excellent services, optimized customer care and friendly hospitality to make your holidays wonderful and memorable.